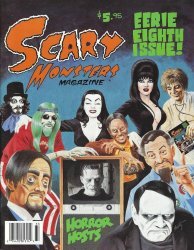 MyMovieMonsters.com > Scary Monsters Magazine > Scary Monsters 1-100 > Scary Monsters magazine #08 - Eerie Eighth Issue! Horror Hosts Homage cover! This is the eerie eighth issue of Scary Monsters, published in September 1993 by founding publisher/editor Dennis Druktenis. Each copy is new, uncirculated and picked directly from the printer's shipping carton. This issue has a front cover celebrating some of the top horror hosts of the time, and a flip cover on the back! Four-color cover and 50 B&W, pulp inside pages.